New Dark Knight trailer…we have it! Batman is back in “Dark Knight” and SheKnows has your preview. “Dark Knight” will have to serve as Heath Ledger’s final completed film. In his role as the Joker to Christian Bale’s Batman, the actor has left quite a legacy. Evidence of that was once again on display with the release of a new trailer from Warner Brothers. 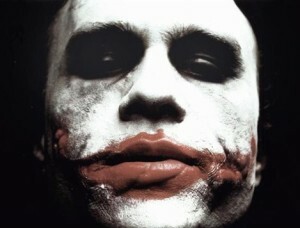 This two and-a-half minute look into the world of “Dark Knight” shows why the world will miss Ledger’s talent so much. Watching him swim in the madness of The Joker is at the same time both inspiration and disheartening. Also introduced in this trailer is “Thank You for Smoking’s” Aaron Eckhart portrayal of legendary Batman character Harvey Dent. The addition of Eckhart to the cast is a coup. As is the replacement of Katie Holmes by Maggie Gyllenhaal. Holmes, never the greatest actress, was more of a paparazzi side show to a franchise looking to be taken seriously after a re-boot. Sparks fly between Gyllenhaal and Bale where there were none with Mrs. Cruise. As the world is embracing its inner “Iron Man,” prepare for the arrival of a superhero movie that has Oscar potential written all over it. Why not? Do you think Oscar nominees Heath Ledger, Christian Bale, Michael Caine (winner!) and Morgan Freeman (winner!) would attach themselves to any project that didn’t have the depth of script? Early buzz has this movie doing just that…breaking barriers between Marvel Comics movie and deeply personal, moving tale of triumph, tragedy and the power to persevere. Ladies and gentlemen, the bat is back!